We offer a range of peripatetic music lessons, in our dedicated music rooms, where pupils can begin to experience the joy of learning an instrument. 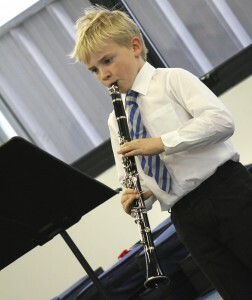 Pupils can currently choose to learn to play piano, clarinet, saxophone, violin and guitar. Orchestra and wind band offer the opportunity for pupils to experience the benefit and delight of playing their instruments in an ensemble setting, thus building up their teamwork skills alongside many performance opportunities. Choir meets once a week to practise vocal techniques and to learn new repertoires. There are many performance opportunities including carol services, concerts and assemblies, as well as in the local community.